The term "shoots" is often confused with "stems"; "shoots" generally refers to new fresh plant growth including both stems and other structures like leaves or flowers. 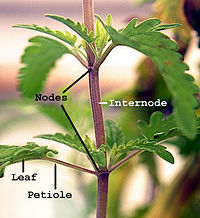 In most plants stems are located above the soil surface but some plants have underground stems. 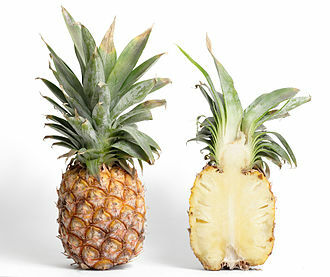 Prickle – a sharpened extension of the stem's outer layers, e.g. roses. Speck, T.; Burgert, I. (2011). "Plant Stems: Functional Design and Mechanics". Annual Review of Materials Research. 41: 169–193. doi:10.1146/annurev-matsci-062910-100425. 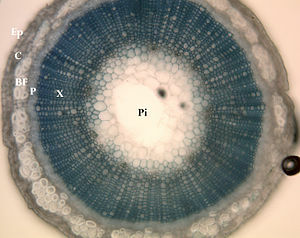 Wikimedia Commons has media related to Plant stem. A rose is a woody perennial flowering plant of the genus Rosa, in the family Rosaceae, or the flower it bears. 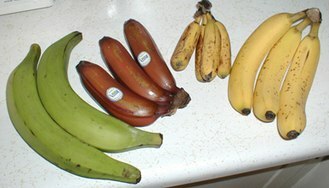 There are over a species and thousands of cultivars. They form a group of plants that can be erect shrubs, flowers vary in size and shape and are usually large and showy, in colours ranging from white through yellows and reds. Most species are native to Asia, with smaller numbers native to Europe, North America, species and hybrids are all widely grown for their beauty and often are fragrant. Roses have acquired cultural significance in many societies, Rose plants range in size from compact, miniature roses, to climbers that can reach seven meters in height. Different species hybridize easily, and this has used in the development of the wide range of garden roses. 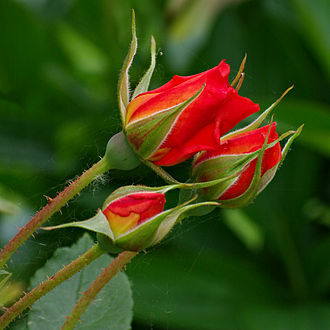 The leaves are borne alternately on the stem, most roses are deciduous but a few are evergreen or nearly so. 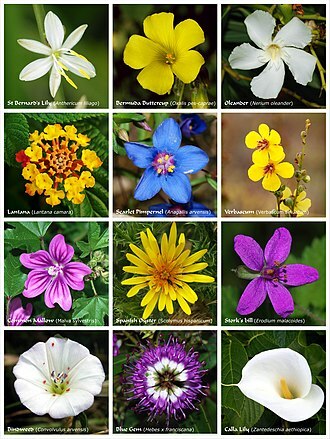 The flowers of most species have five petals, with the exception of Rosa sericea, each petal is divided into two distinct lobes and is usually white or pink, though in a few species yellow or red. 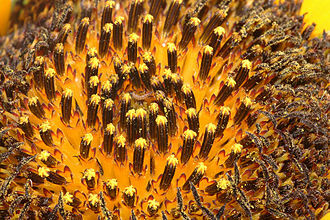 Beneath the petals are five sepals and these may be long enough to be visible when viewed from above and appear as green points alternating with the rounded petals. There are multiple superior ovaries that develop into achenes, the aggregate fruit of the rose is a berry-like structure called a rose hip. Many of the domestic cultivars do not produce hips, as the flowers are so tightly petalled that they do not provide access for pollination, the hips of most species are red, but a few have dark purple to black hips. Each hip comprises an outer layer, the hypanthium, which contains 5–160 seeds embedded in a matrix of fine. Rose hips of some species, especially the dog rose and rugosa rose, are rich in vitamin C. The hips are eaten by fruit-eating birds such as thrushes and waxwings, some birds, particularly finches, eat the seeds. While the sharp objects along a stem are commonly called thorns. 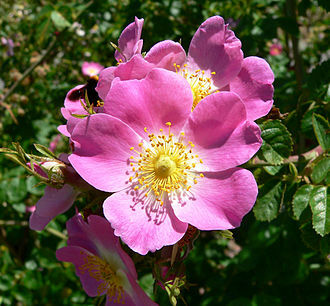 Rose prickles are typically sickle-shaped hooks, which aid the rose in hanging onto other vegetation growing over it. In vascular plants, the root is the organ of a plant that typically lies below the surface of the soil. 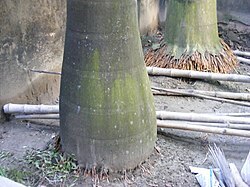 Roots can be aerial or aerating, that is growing up above the ground or especially above water, furthermore, a stem normally occurring below ground is not exceptional either. Therefore, the root is best defined as the non-leaf, non-nodes bearing parts of the plants body, important internal structural differences between stems and roots exist. The fossil record of roots – or rather, infilled voids where roots rotted after death – spans back to the late Silurian and their identification is difficult, because casts and molds of roots are so similar in appearance to animal burrows. They can be discriminated using a range of features, the first root that comes from a plant is called the radicle. In response to the concentration of nutrients, roots synthesise cytokinin, Roots often function in storage of food and nutrients. The roots of most vascular plant species enter into symbiosis with fungi to form mycorrhizae. In its simplest form, the root architecture refers to the spatial configuration of a plant’s root system. This system can be complex and is dependent upon multiple factors such as the species of the plant itself, the composition of the soil. The configuration of root systems serves to support the plant, compete with other plants. 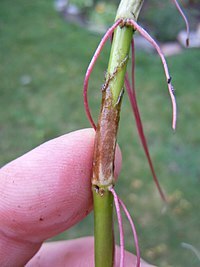 Roots grow to specific conditions, which, if changed, can impede a plants growth. For example, a system that has developed in dry soil may not be as efficient in flooded soil, yet plants are able to adapt to other changes in the environment. Root architecture plays the important role of providing a supply of nutrients and water as well as anchorage. The main terms used to classify the architecture of a system are, Branch magnitude. Root angle, the angle of a lateral root’s base around the parent root’s circumference, the angle of a lateral root from its parent root. Link radius, the diameter of a root, all components of the root architecture are regulated through a complex interaction between genetic responses and responses due to environmental stimuli. Narcissus /nɑːrˈsɪsəs/ is a genus of predominantly spring perennial plants in the Amaryllidaceae family. Various common names including daffodil, daffadowndilly and jonquil are used to all or some members of the genus. Narcissus has conspicuous flowers with six petal-like tepals surmounted by a cup- or trumpet-shaped corona, the flowers are generally white or yellow, with either uniform or contrasting coloured tepals and corona. Narcissus were well known in ancient civilisation, both medicinally and botanically, but formally described by Linnaeus in his Species Plantarum, the genus is generally considered to have about ten sections with approximately 50 species. The number of species has varied, depending on how they are classified, the genus arose some time in the Late Oligocene to Early Miocene epochs, in the Iberian peninsula and adjacent areas of southwest Europe. The exact origin of the name Narcissus is unknown, but it is linked to a Greek word for intoxicated. The English word daffodil appears to be derived from asphodel, with which it was commonly compared, the species are native to meadows and woods in southern Europe and North Africa with a center of diversity in the Western Mediterranean, particularly the Iberian peninsula. Both wild and cultivated plants have naturalised widely, and were introduced into the Far East prior to the tenth century, Narcissi tend to be long-lived bulbs, which propagate by division, but are insect-pollinated. Known pests and disorders include viruses, the larvae of flies and nematodes, some Narcissus species have become extinct, while others are threatened by increasing urbanisation and tourism. Today narcissi are popular as cut flowers and as plants in private. The long history of breeding has resulted in thousands of different cultivars, for horticultural purposes, narcissi are classified into divisions, covering a wide range of shapes and colours. Like other members of their family, narcissi produce a number of different alkaloids, which provide protection for the plant. This property has been exploited for use in traditional healing and has resulted in the production of galantamine for the treatment of Alzheimers dementia. Long celebrated in art and literature, narcissi are associated with a number of themes in different cultures, ranging from death to good fortune, the daffodil is the national flower of Wales and the symbol of cancer charities in many countries. This glossary is incomplete, you can help by expanding it, you can help by adding illustrations that assist an understanding of the terms. Ab- A prefix meaning from, away from, or outside of, abaxial The surface of an organ facing away from the axis, e. g. the lower surface of a lateral organ such as a leaf or petal. Abort To abandon development of a structure or organ, abscission shedding of an organ that is mature or aged, e. g. a ripe fruit or an old leaf. 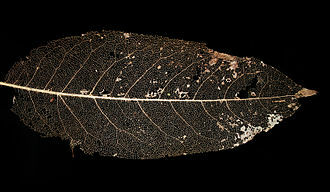 Abscission zone a specialised layer of tissue formed, for example, acaulescent An adjective descriptive of a plant that has no apparent stem, or at least none visible above ground. Examples include some species of Agave and Attalea, accrescent Increasing in size with age, such as a calyx that continues to grow after the corolla has fallen, for example in Physalis peruviana. 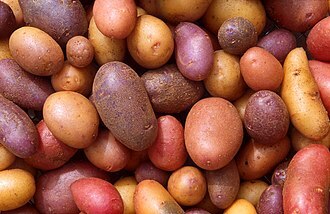 -aceae The suffix added to the stem of a name to form the name of a family. Achene A dry 1-seeded indehiscent fruit, e. g. in the genus Ranunculus, acropetal Moving from roots to leaves, e. g. of molecular signals in plants. Acrophyll The regular leaves of a plant, produced above the base. Acrostichoid covering the entire surface of the frond, usually densely so. 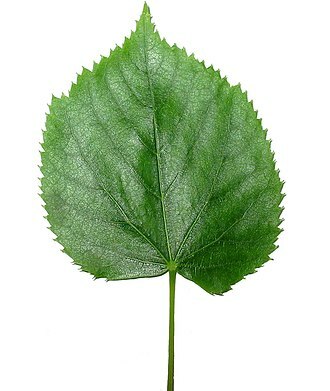 Actino- A prefix that indicates a radial form, actinodromous palmate or radially arranged venation with three or more primary veins arising from at or near the base of the leaf, the primary veins reaching the margin or not. Actinomorphic regular, radially symmetrical, may be bisected into similar halves in at least two planes. Applies e. g. to steles and flowers in which the segments within each whorl are alike in size and shape, compare regular, contrast with asymmetrical, irregular. Aculeate Armed with prickles, e. g. the stem of a rose, acuminate Tapering gradually to a point. Acute Sharply pointed, converging edges making an angle of less than 90°, ad- A prefix meaning near or towards. 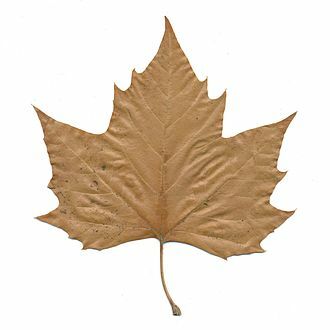 Adaxial The surface of an organ facing towards the axis, e. g. the upper surface of an organ such as a leaf or petal. Adnate grown or fused to an organ of a different kind, especially along a margin, e. g. a stamen fused to a petal, cf. connate. Polygonatum /ˌpɒlᵻˈɡɒnətəm/, known as King Solomons-seal or Solomons seal, is a genus of flowering plants. In the APG III classification system, it is placed in the family Asparagaceae and it has been classified in the former family Convallariaceae and, like many lilioid monocots, was formerly classified in the lily family, Liliaceae. The genus is distributed throughout the temperate Northern Hemisphere, most of the approximately 63 species occur in Asia, with 20 endemic to China. Polygonatum comes from the ancient Greek for many knees, referring to the multiple jointed rhizome, one explanation for the derivation of the common name Solomons seal is that the roots bear depressions which resemble royal seals. Another is that the cut roots resemble Hebrew characters, the fruits are red or black berries. 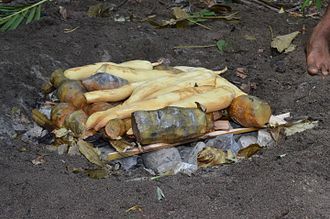 Leaves and rhizomes are used raw or cooked and served as a dish with meat. 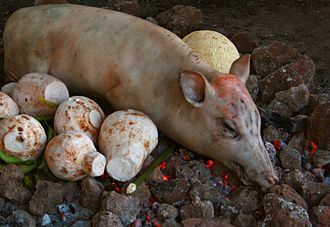 The rhizomes of two species are eaten with chickens or pigs feet during festivals. The rhizomes are used to make tea or soaked in wine or liquor to flavor the beverages and they are fried with sugar and honey to make sweet snacks. 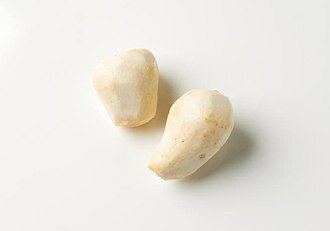 The starchy rhizomes can be dried and added to flour to supplement food staples, the rhizome of P. sibiricum is pulped, boiled and thickened with barley flour to make a sweet liquid seasoning agent called tangxi. At times, people in China have relied on P. megaphyllum as a famine food, the shoots of some Polygonatum can be boiled and used like asparagus. 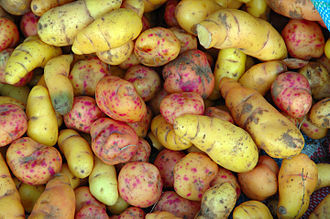 P. cirrifolium and P. verticillatum are used as vegetables in India. 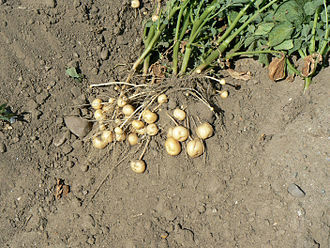 The American species P. biflorum has a root that was eaten like the potato. P. sibirica is used for a tea called dungulle in Korea, the traditional use of Polygonatum in the treatment of diabetes was first observed in 1930 by Hedwig Langecker. 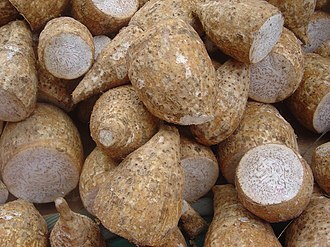 After experiments, she concluded that it was effective in fighting nutritional hyperglycemia, though not that caused by adrenaline release, P. verticillatum is used in Ayurveda as an aphrodisiac. It is used to treat pain, inflammation, allergy, an herbal remedy called rhizoma polygonati is a mix of Polygonatum species used in traditional Chinese medicine. The garden strawberry is a widely grown hybrid species of the genus Fragaria. It is cultivated worldwide for its fruit, the fruit is widely appreciated for its characteristic aroma, bright red color, juicy texture, and sweetness. 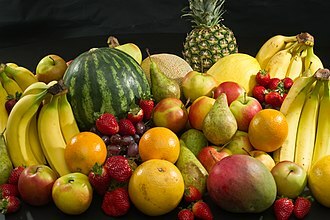 It is consumed in quantities, either fresh or in such prepared foods as preserves, fruit juice, ice creams, milkshakes. Artificial strawberry flavorings and aromas are used in many products like lip gloss, hand sanitizers, perfume. 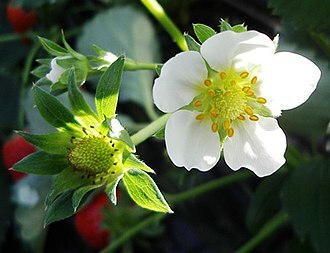 Cultivars of Fragaria × ananassa have replaced, in production, the woodland strawberry. Technically, the strawberry is an accessory fruit, meaning that the fleshy part is derived not from the plants ovaries. 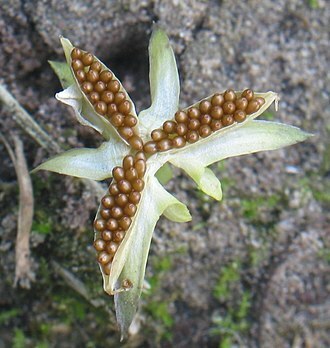 Each apparent seed on the outside of the fruit is one of the ovaries of the flower. The first garden strawberry was grown in Brittany, France during the late 18th century, prior to this, wild strawberries and cultivated selections from wild strawberry species were the common source of the fruit. The strawberry fruit was mentioned in ancient Roman literature in reference to its medicinal use, the French began taking the strawberry from the forest to their gardens for harvest in the 14th century. Charles V, Frances king from 1364 to 1380, had 1,200 strawberry plants in his royal garden, in the early 15th century western European monks were using the wild strawberry in their illuminated manuscripts. The strawberry is found in Italian and German art, the entire strawberry plant was used to treat depressive illnesses. By the 16th century references of cultivation of the strawberry became more common, people began using it for its supposed medicinal properties and botanists began naming the different species. In England the demand for regular strawberry farming had increased by the mid-16th century, the combination of strawberries and cream was created by Thomas Wolsey in the court of King Henry VIII. Instructions for growing and harvesting strawberries showed up in writing in 1578, by the end of the 16th century three European species had been cited, F. vesca, F. moschata, and F. viridis. The garden strawberry was transplanted from the forests and the plants would be propagated asexually by cutting off the runners, two subspecies of F. vesca were identified, F. sylvestris alba and F. sylvestris semperflorens. A vine in the narrowest sense is the grapevine, but more generally it can refer to any plant with a growth habit of trailing or scandent stems, lianas or runners. The word can refer to such stems or runners themselves, in the United Kingdom, the term vine applies almost exclusively to the grapevine. The term climber is used for all climbing plants, certain plants always grow as vines, while a few grow as vines only part of the time. For instance, poison ivy and bittersweet can grow as low shrubs when support is not available, a vine displays a growth form based on long stems. This has been a successful growth form for plants such as kudzu and Japanese honeysuckle. There are some tropical vines that develop skototropism, and grow away from the light, growth away from light allows the vine to reach a tree trunk, which it can climb to brighter regions. The vine growth form may enable plants to large areas quickly. 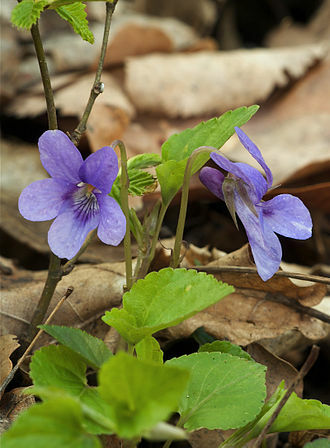 This is the case with periwinkle and ground ivy and it is an adaptation to life in areas where small patches of fertile soil are adjacent to exposed areas with more sunlight but little or no soil. 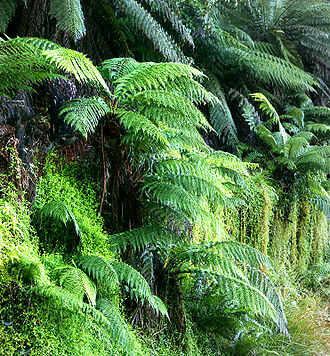 A vine can root in the soil but have most of its leaves in the brighter, exposed area, the evolution of a climbing habit has been implicated as a key innovation associated with the evolutionary success and diversification of a number of taxonomic groups of plants. It has evolved independently in several plant families, using many different climbing methods such as and it directs its stem into a crevice in the bark of fibrous barked trees where the stem adopts a flattened profile and grows up the tree underneath the host trees outer bark. The fetterbush sends out branches that emerge near the top of the tree and these may be divided into woody vines or lianas, such as wisteria and common ivy, and herbaceous vines, such as morning glory. One odd group of vining plants is the fern genus Lygodium, the stem does not climb, but rather the fronds do. The fronds unroll from the tip, and theoretically never stop growing, they can form thickets as they unroll over other plants, gardeners can use the tendency of climbing plants to grow quickly. If a plant display is wanted quickly, a climber can achieve this, climbers can be trained over walls, fences, etc. Climbers can be grown over other plants to provide additional attraction, artificial support can be provided. Viola cultivar showing the large round flowers and the novel coloration that has been achieved through breeding. One of the largest taro-growing areas in the Hawaiian Islands is on Kauaʻi, in the Lower Hanalei Valley. The inflorescence of Delphinium nuttallianum. Each flower is held on a pedicel from one to several centimeters long.